Fires in forests and former forestlands occur in Indonesia in the dry season every year – particularly in the provinces of Riau and Jambi on the island of Sumatra, and West Kalimantan and Central Kalimantan on the island of Borneo. However, the haze that spreads to other countries is no longer restricted to drought years, and has become increasingly frequent due to ongoing deforestation of peatlands in Indonesia. Fires begin and spread for many reasons, so it is misleading to think of “fires” as the problem — or even as a single problem. Complex socioeconomic, ecological and governance factors are involved, meaning that the problem — and the solutions — go beyond who actually lights the match. How and why do fires start? For local communities, smallholder farmers and companies, fire is a cheap and easy tool to clear land for agriculture and to access swamps. Large companies use fire to clear land in oil palm and timber plantations on both peat areas and non-peatlands. Large-scale developments, such as oil palm and timber plantations make the landscape more prone to fire by degrading the peatlands through logging and drainage. For example, drained and logged-over forests on peatlands suitable for conversion to oil palm plantations are more susceptible to extensive burning. When peatlands are excessively drained, as happens in plantation developments, upper layers dry up and become prone to fire. Repeatedly burned vegetation is more prone to fire. Large-scale developments contribute to expanding use of fires by communities because developments attract migrants and improve access to previously remote areas. Large-scale developments can trigger conflicts where local communities feel their land has been unfairly taken away. Once land is cleared, mid-level investors can engage in land transaction and land speculation. This is a process that is enabled by weak governance and unclear spatial planning. Fire is a symptom of unclear and/or un-enforced land tenure, leading to overlapping land claims between different levels or sectors of government agencies, and between companies and communities. In these cases, fire is used as a way to claim land by these actors. Evidence from the World Resources Institute suggests that 20 percent of fires in 2013 were in oil palm concessions, according to satellite data from NASA mapped onto the Indonesian Ministry of Forestry’s (now the Ministry of Environment and Forestry – MoEF) concession maps. CIFOR’s 2013 analysis of satellite imagery for the area in Riau Province, Sumatra, raised important insights about the location, context and causes of the fire incidents. Recent CIFOR research has found that the situation is even more complex than commonly realized. Communities also occupy land in concessions, and some fires started outside concessions and spread into concession areas. How much does the climate have to do with it? Fire events usually occur during drought years induced by climate anomalies from the Pacific (El Niño Southern Oscillation) and Indian oceans (Indian Ocean Dipole). However, even in non-El Niño years, fires can occur — fires in June 2013 and February 2014 were exacerbated by a regular short dry periods, not El Niño. Many are concerned about large fires in 2015, exacerbated by El Niño. What is the relationship between oil palm and the haze crisis? The haze crisis is caused, at least in part, by the clearing of land for plantation estates. 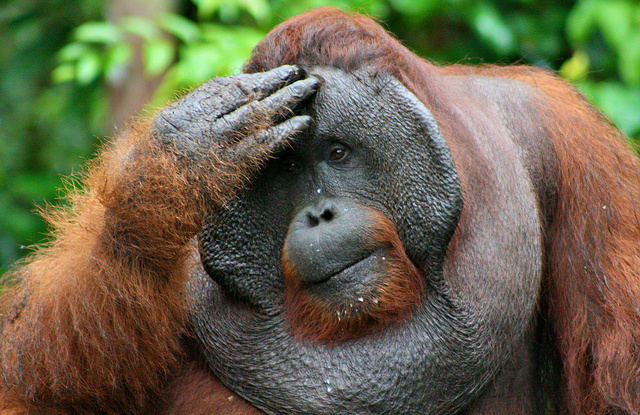 Demand for land in Indonesia is mostly driven by a global demand for palm oil. Indonesia provided 52% of the world’s oil palm supply in 2014, with investment support from Malaysia and Singapore. Eleven million ha of oil palm plantations – owned by Indonesian, Malaysian and Singaporean companies – exported 33 million tons of palm oil in 2014, reaping revenues of USD 18.4 billion. What laws in Indonesia aim to prohibit the lighting of fires? Burning to clear land is prohibited under Law No. 32/2009 on the Protection and Management of Environment and under Government Regulation No. 4/2001 on Management of Environmental Degradation and/or Pollution linked to Forest or Land Fires. Possible penalties for those found guilty of breaching Law No. 32/2009 include fines and prison terms. Why haven’t the legal restrictions worked? Enforcing legal restrictions on large companies has proven difficult, partly because of diffused responsibility across different levels of government and the judiciary. Assembling sufficient evidence to support legal prosecution is onerous. In the few court cases that have attempted to prosecute alleged illegal burning, both criminal responsibility and civil liability have been difficult to prove. Local institutions often do not have the capacity, resources or political will to enforce laws; for regional officials, enforcing the central burn ban would be “political suicide”. Research from earlier years showed that some large companies were more willing to risk being found guilty and having to pay a fine than to pay to institute preventative measures. Are there any other mechanisms in place that can help? Indonesia’s forest moratorium prohibits authorities from issuing new permits for development on peatland. However, conversion to oil palm plantations can go ahead for concessions already awarded; some of these are on peatland. Corporate actors in the oil palm sector and pulp and paper sectors are making new environmental sustainability commitments, while novel mapping resources are increasing third parties’ monitoring capabilities. The Indonesian government has introduced the Indonesian Sustainable Palm Oil (ISPO) scheme, which bans the use of fire in plantation development. It will be mandatory for all oil palm companies in the country by the end of 2014. Companies seeking to be compliant with Roundtable on Sustainable Palm Oil (RSPO) requirements must not use fire in their field operations; compliance is important if these companies want to sell their palm oil in eco-sensitive markets such as the European Union. Why is the haze worse in some years? 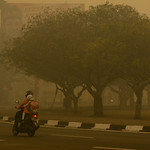 The smoke haze in Singapore and elsewhere was generated mostly by smoldering fires on peatland. Smoke from fires in other land types is a less significant contributor. The haze may be caused by peat fires recently lit, or by fires lit long ago that smolder and re-ignite. In particularly dry years, the peat below ground also catches fire and can smolder for months. The haze lingers because the fires do too. Fires are in peat around 3 to 4 meters underground. Firefighters have to insert a hose into the peat to douse the fire. Research has shown that extreme air pollution episodes in Southeast Asia are no longer restricted to drought years. Ongoing deforestation of peatlands will lead to more haze events with less predictability. What are the implications for efforts to reduce emissions for climate change mitigation? 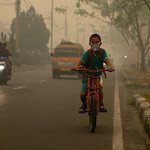 Peat fires are a major contributor to emissions from Indonesia. According to Indonesia’s Second National Communication to the U.N. Framework Convention on Climate Change (UNFCCC), greenhouse gas emissions from peat fires increased from 172,000 Gg CO2-eq. (gigagrams of carbon dioxide equivalent) in 2000 to 451,000 in 2005. Peat fires were the largest single source of greenhouse gas emissions in 2005 (larger than energy), when peat fires accounted for about 40 percent of Indonesia’s greenhouse gas emissions. A 2009 assessment from Bappenas (Indonesia’s National Development and Planning Agency) suggests that, between 2000 and 2006, Indonesia’s peatland greenhouse gas emissions from fire, peat oxidation and loss of above-ground biomass through deforestation amounted to an average of 903,000 Gg CO2 annually. Another estimate puts the carbon release of the 1997 fires at 1.45 Gt (gigatons), equivalent to 0.73 ppmv (parts per million by volume) of CO2, or almost half the annual global atmospheric CO2 growth. Indonesia has voluntarily committed to mitigating climate change by reducing its greenhouse gas emissions by 26 percent by 2020 and 41 percent by 2050. More than half of this reduction was meant to come from the forestry/peatlands sector. Avoiding peat fires is therefore crucial for Indonesia to meet its targets. In 1997-1998, carbon emissions were high enough to elevate Indonesia to one of the largest global polluters. How much has the haze crisis likely cost? The Indonesian National Disaster Mitigation Agency (BNPB) estimated economic losses worth more than USD 1.7 billion from fires in Riau between February and April 2014. For the 1997/98 fires, an estimate by WWF and the Environmental Emergency Project (EEP) of the Indonesian Ministry of Environment arrived at figures of more than USD 6 billion. Based on the 2004 carbon market price, emissions from the 1997 fire episode were worth around USD 3.6 billion. The 1997 fires adversely affected the health, property and livelihoods of some 75 million people. What steps have been taken in the aftermath of the 2013 fires? High-level regional talks in late 2013 led to the adoption of a proposed transboundary haze monitoring system. A multi-stakeholder workshop was held in Jakarta to discuss areas of research into the haze crisis. CIFOR published data on the Riau fires in an online map for effective and transparent access to information. In 2014, Singapore operationalized the Transboundary Haze Pollution Act to fine those responsible for burning Indonesian peatlands. In 2014, Indonesia ratified a regional 2002 agreement to fight transboundary haze. 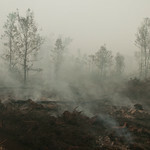 Following his visit to Riau in November 2014, Indonesian President Joko Widodo promised to review controversial concessions in Indonesia to curb haze and peatland fires. Subsequently, Indonesian Minister of Environment and Forestry, Siti Nurbaya, made fire reduction a key performance indicator for the MoEF over the next five years. In September 2015, Indonesia and Singapore began taking legal action against companies linked to haze. Southeast Asian ministers have promised to develop a roadmap in 2016 to achieve a vision of a haze-free Association of Southest Asian Nations (ASEAN) by 2020.